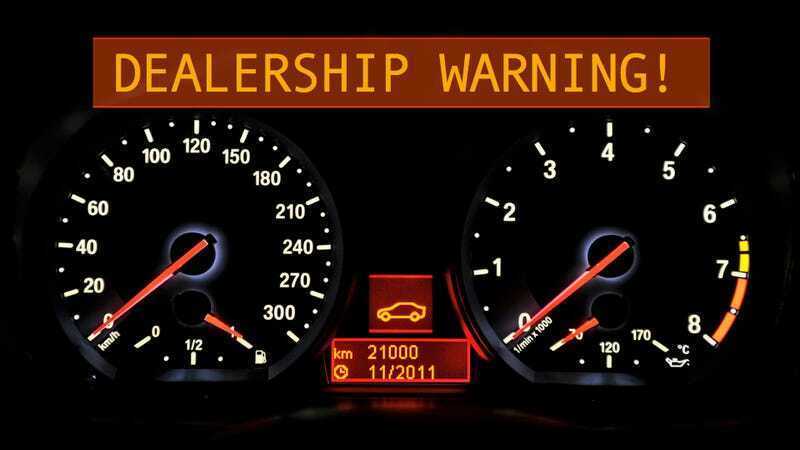 Did A Dealer Ignore A Faulty, Dangerous BMW? Last month when Steve Rock saw the warning lights on his BMW 335i suddenly light up he quickly called his BMW dealership, who informed him he should bring his car in immediately. Once there they dismissed the warnings and sent him on his way. Two days later the steering in his BMW failed and he crashed off the road. Rock now claims the BMW dealership, the dealership's parent company Penske Automotive, and BMW North America have repeatedly ignored him, obfuscated the truth, and treated him poorly for trying to bring the story to people's attention. According to Rock, the problems started in early December when he saw the dashboard in his Certified Pre-Owned 2007 BMW 335i light up like George Clinton backstage at a Parliament show. He called his local dealership — BMW North Scottsdale — and was told by an operator to bring the car in. Just 15 minutes later and Rock is in the service bay getting his car looked at by a service technician. This is where the problems start to get worse, according to Rock. "[The] intro level service advisor comes out and tells me that based on what I described to the receptionist, the problem is a state required emissions check alert that isn't required in the state of Arizona and he is just going to go turn off the warning signals so they don't continue to bother me. I repeatedly ask him "are you sure, these seem pretty serious?" He insists that all it is is the emissions issue and he knows best because he deals with countless numbers of these on a daily basis. He has me sit in a waiting area inside the bay while he goes into my driver seat and does (what I assume is turn off the codes. I can only assume because I wasn't in the car with him). He comes out and tells me "you're good to go." Apprehensive about the diagnosis but with no recourse he reluctantly trusts the diagnosis and drives away. Two days later Rock is driving approximately 65-75 mph on the freeway when his steering starts to fail. First, the car drifts to the right and when Rock tries to compensate the steering stops working altogether. Fearful of a hard crash and unable to steer he slows the car down as much as possible then applies the brakes before it goes off the road, which it does at approximately 35 mph. "It wasn't the prettiest landing but I stuck it, I was alive and not seriously injured," says Rock. "Half the car is on the right shoulder and half the car is in an uphill bed of rocks at about a 45 degree angle." This caused damage to the wheels of the car and other issues. The police and medical units arrive but Rock is fine and has the car picked up by a flatbed. Rock then wrote the General Manager of the BMW Dealership to inform them of what happened. The GM, according to Rock, doesn't apologize but asks the car be brought into the shop. Rock, no longer trusting the dealership, says he wants it brought elsewhere. Rock then posts the information on the E90post forum to determine if anyone else has had similar issues and for advice. After learning from fellow forum users that the signals he saw had nothing to do with an emissions check Rock then goes to the dealership to meet with the GM, who tells him he can only bring the car to his dealership and that it's a minor problem. I express concerns as to why I'm not comfortable taking it back to his dealership based on previous events and he rudely replies "then you shouldn't even be in my office wasting my time." I keep playing "nice" and tell him that I just want some reassurance that work and diagnostic would be done correctly. GM proceeds to chuckle and remind me that my car is an "older model" 3 series and that it's a "small problem that would be taken care of." Rock reluctantly agrees again to let them see the car and a flatbed truck is dispatched to Rock's house afterwards to pick it up. At the dealership Rock says he tries to get a loaner BMW but is then treated poorly by the staff. He picks up his car and, slowly, drives it home. BMW North America contacts Rock and asks him to bring the car to a different dealership and promises, in Rock's recollection, that a team of "specialized" engineers would fly in to see it. Instead, the local service tech looks at it and confirms there's an issue with the car's traction and stability control, but "will not elaborate further" according to Rock. They charge him his $50 deductible but only fix the two issues covered under his CPO warranty. Neither Penske nor BMW has, according to Rock, explained what the original issue was or will take any responsibility for sending him back out with a car that was potentially broken. When Rock inquires as to why, he says both BMW and Penske say they "don't appreciate that I've made this a public issues on the forums." At this point Rock isn't asking for money or for them to fix the damage to his car caused by his accident. He says he merely wants to hear from the dealership or BMW why he was told his car had an emissions problem and not a bigger issue and what, exactly, the issue with his car was. We contacted the dealership and Penske Automotive and received a call from David Nelson, an attorney for the company who declined to comment because "we've got a legal matter with Mr. Rock, because it's a potential legal matter we can't make a comment at this time." Rock hasn't hired an attorney and hasn't filed any lawsuits. But, pressed to comment further, Mr. Nelson again declined.